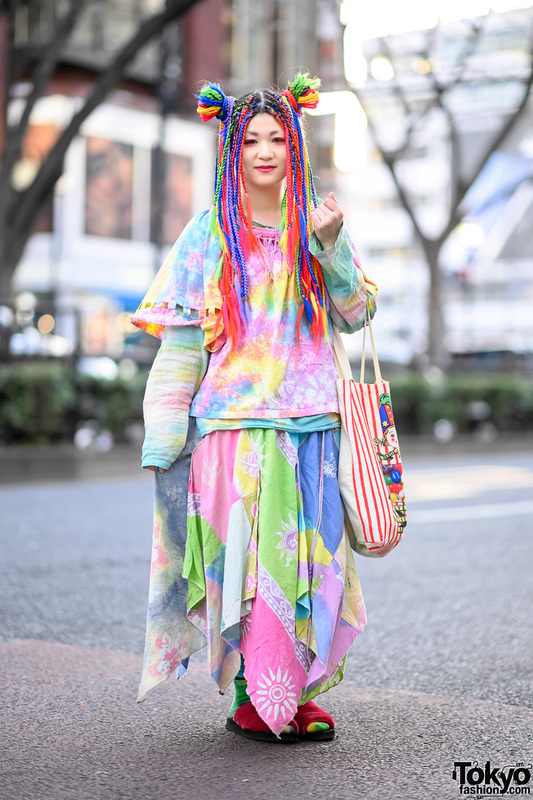 Here’s a stylish 18-year-old Japanese student named Miyu who we photographed near Bubbles Harajuku. Her pretty lavender-pink hairstyle is one of the most eye-catching elements of this look. 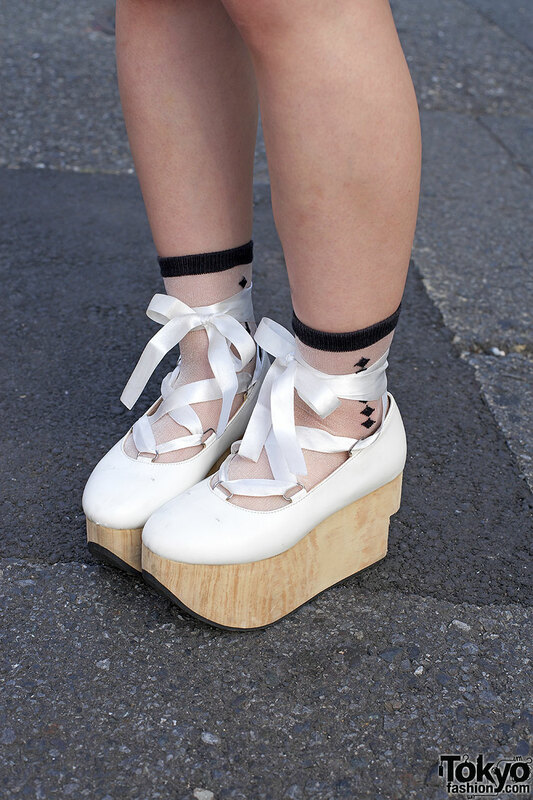 Miyu is wearing a white lace bustier top over a black lace top from Forever 21, a black leather skirt that she picked up resale, graphic socks, and rocking horse shoes from Body Line. 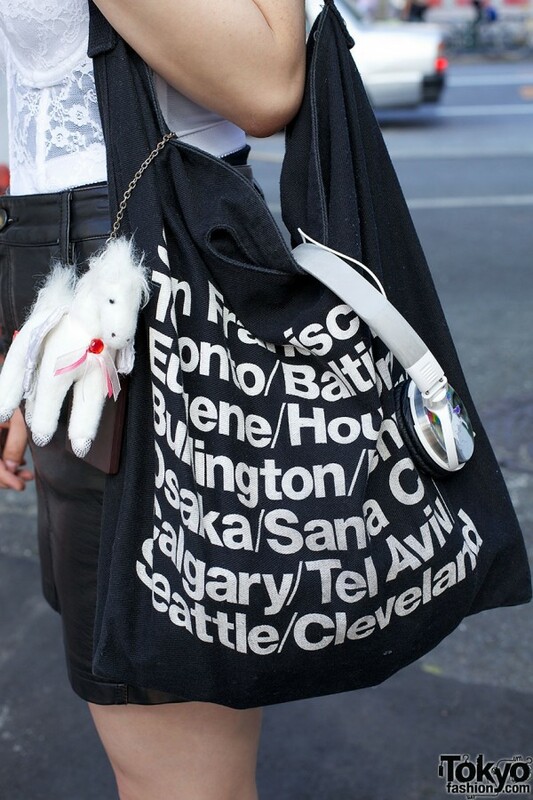 Accessories – many of which came from Bubbles Harajuku – include large cross earrings, a tattoo necklace, a prayer/saints bracelet, a pearl bracelet, a large vintage ring, and an American Apparel canvas bag with a stuffed Pegasus charm. Miyu told us that her favorite shop is Bubbles and her favorite band right now is Ellegarden. If you’d like to know more about her – and see more picture of her fashion – check out Miyu’s personal Twitter. Her face is very pretty!! Love the lace corset top! Underwear as outerwear is pretty much the best thing ever. Lavender pink, and smolder pink colors are just lovely! why is her bra outside?